Naples, Fla. (November 17, 2017) – The evidence that a hurricane hit the Naples area in September became less visible in October because residents were quick to address damages to their property and our county and utility service providers worked overtime to get the area back to normal as quickly as possible. 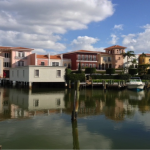 The Naples area housing market finished on a positive note in October with closed sales increasing 1 percent over last October, according to the October 2017 Market Report released by the Naples Area Board of REALTORS® (NABOR®), which tracks home listings and sales within Collier County (excluding Marco Island). 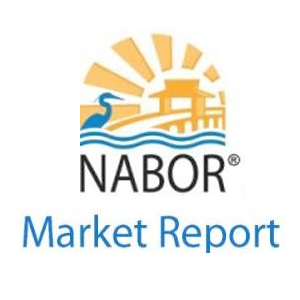 October’s housing market activity was better than NABOR® expected. 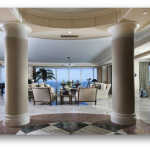 There were 57 closed sales of high-end, luxury properties priced above $1 million in October, a 36 percent increase over October 2016. Yet closed sales of properties priced below $300,000 dropped 12 percent, a loss of just 32 sales compared to October 2016. Also reflected in the October report, closed sales for single-family homes priced between $1-$2 million increased 50 percent in October, while closed sales of condominiums priced between $300,000-$500,000 increased 26 percent. A lull in inventory following the hurricane was predicted by broker panelists at NABOR®’s Third Quarter Market Conference. Their prediction was spot on as the October report shows an 8 percent decrease in inventory, or about 400 fewer homes available compared to October 2016 levels. 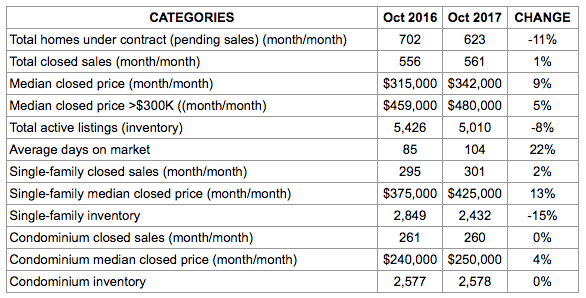 Inventory increased on the high and low end of the condominium market in October. 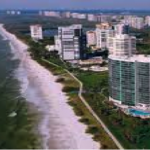 While the report showed no increase or decrease in inventory overall, there were an additional 76 condominiums (a 7 percent increase) added to the $300,000 and below market in October, and 10 condominiums (a 10 percent increase) were added to the $2 million and above market. Median closed prices in the single-family home market increased to $425,000 (13 percent) in October, while median closed prices in the condominium market increased to $250,000 (4 percent). Interestingly, the median closed price for condominiums in the $2 million and above price category dropped 42 percent in October to $2,545,000, while the median closed price for single-family homes in the same price category increased 22 percent to $2,237,000. Compared to closed sales in September, which dropped 30 percent month over month, October’s 1percent increase in closed sales is an indication that we recovered rather quickly from the hurricane, and buyer interest in our market is still very strong. If the hurricane hadn’t happened and the market had kept the same pace as it did last September and October, we would have seen 400 more sales and been on track for a 6 percent increase in total closed sales year-to-date.